Marcus, you are really cranking on this build. Is your target date for project completion next week? Great tips on the frame building and keeping things straight. thanks for posting this great build! Any wonder your bowl/hubcap came out so well (and mine came out like ). Got the frame dead level and square to the millimetre by measuring corner to corner. Make sure the rails are exactly the same length too. I noticed that mine were 3mm-1/8" different even before I started altering them. They were still that much out once I had made all my alterations, so I shortened one to match the other BEFORE laying any of the suspension points etc out. It is also important to run a string line right up the middle of the frame and measure off to each side along points to make sure there is no bow in the frame any where. 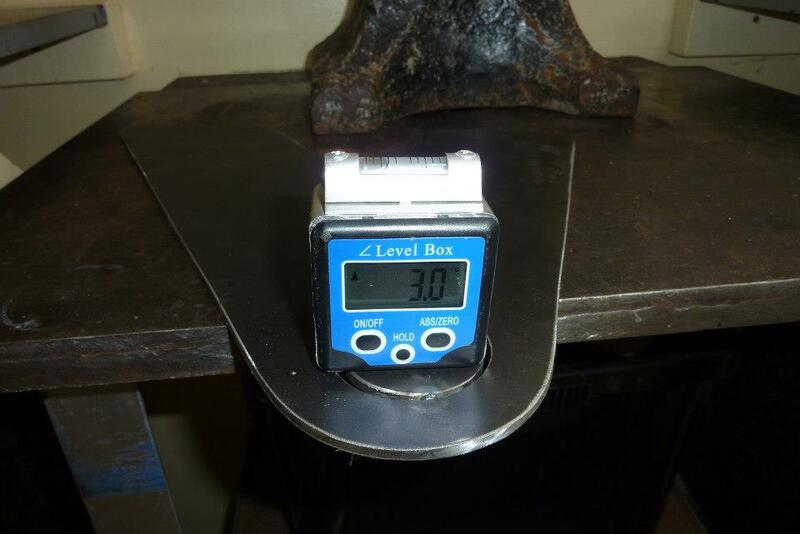 You can have a frame measure square and still have a bow in a rail. I have gotten mine to 1.5mm accuracy off the centreline, so pretty happy with that. The V6 version of the Grand Cherokee donor does not come with the stiffening bar between the upper suspension mounts, but my 5.7 Hemi does. I decided to stiffen it up even more by adding a second one as well. I may still plate these to make them even stronger, or make whole new ones depending on the clearance once everything is in place. In the mean time it shows at least that the distance the mounts are apart is still at factory specification. They fit right on without any levering needed. 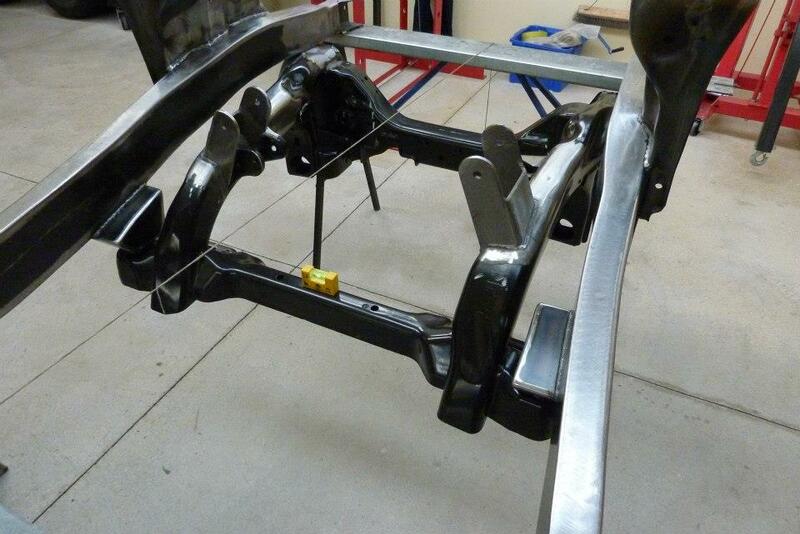 Added the final brackets that I had removed from the donor that hold the rear panhard/trackbar in place. It bolts into 5 places, the same as stock. 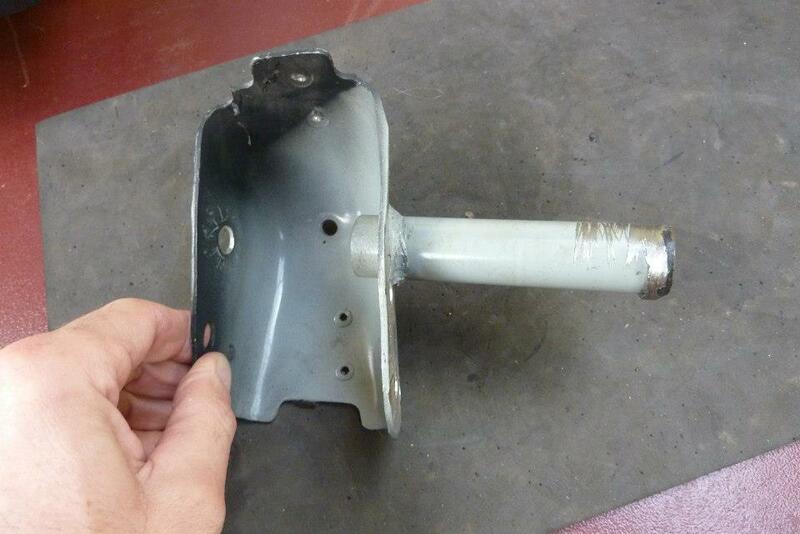 Here is that cross member I made out of two stock Willys ones earlier, now tacked into place between the coil mounts. Last edited by Gojeep; 08-01-2017 at 03:10 AM. Time to add the front cradle. Front mounts for this were already installed before I plated the rails you might remember. 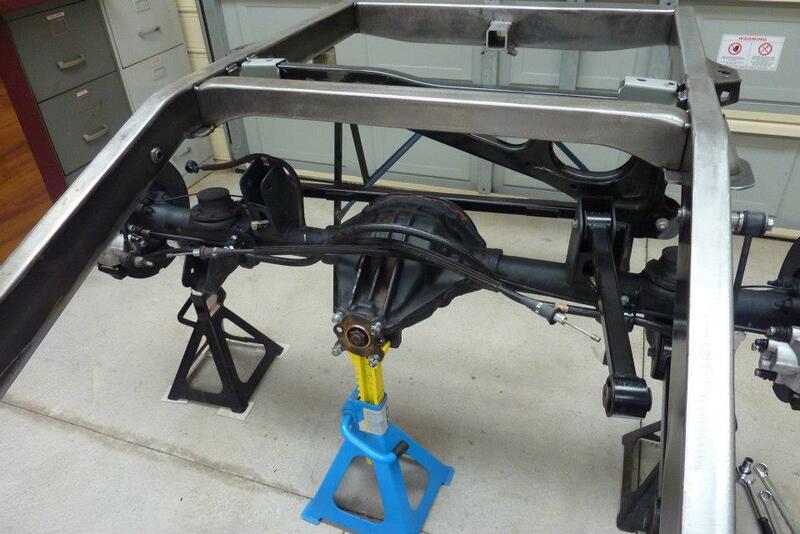 So bolted in the front and then made sure the frame was square to the centreline. 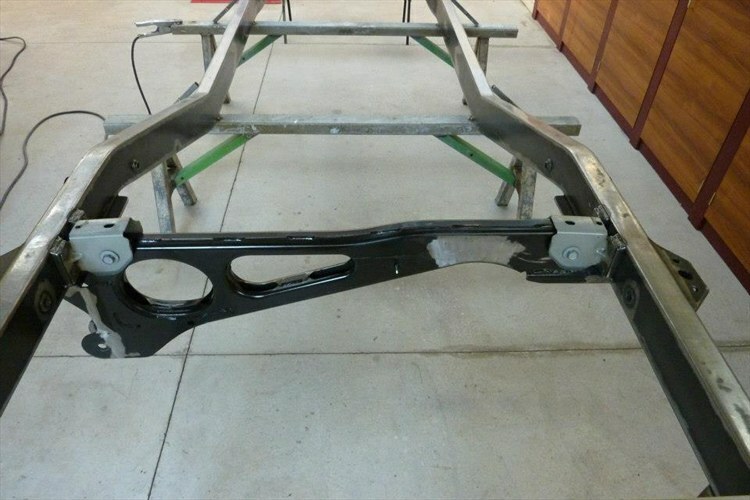 The rear mounts are quite a bit lower than the Willys frame rails and are inboard. 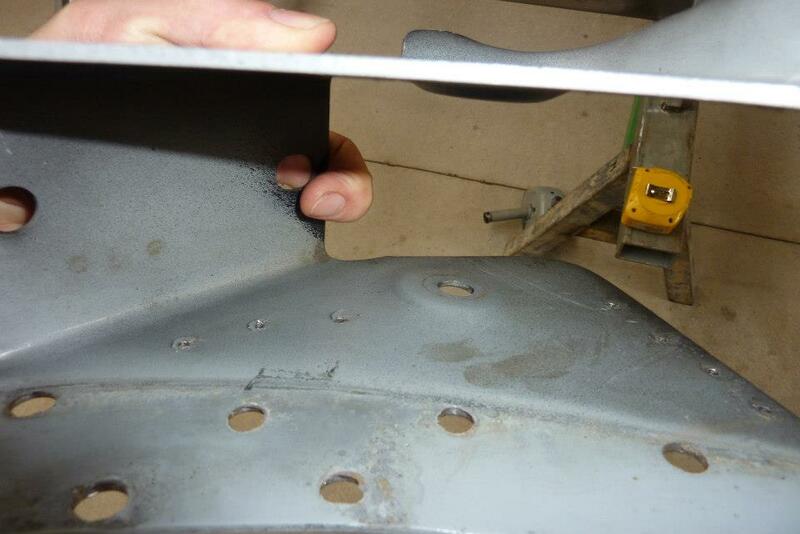 This is the rear mounts inside the Grand frame rails that I had cut out. 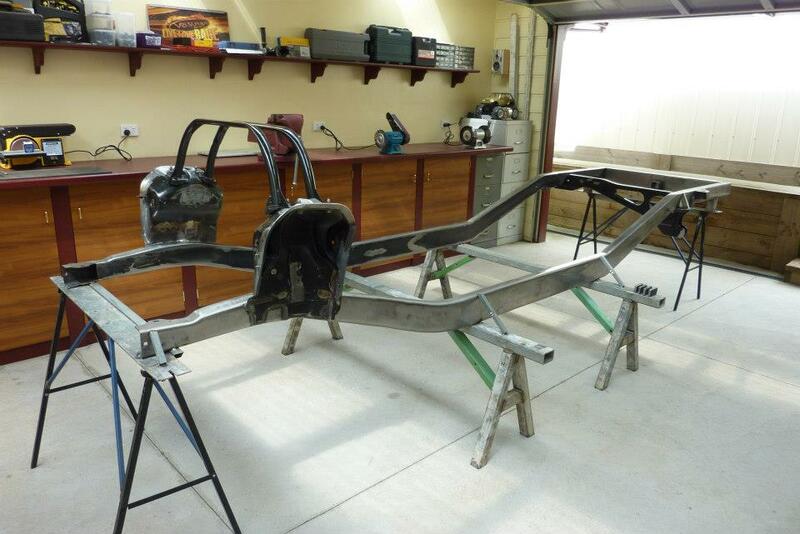 I cut and made the pieces of the donors frame rails to fit, but didn't like the way it looked at all. 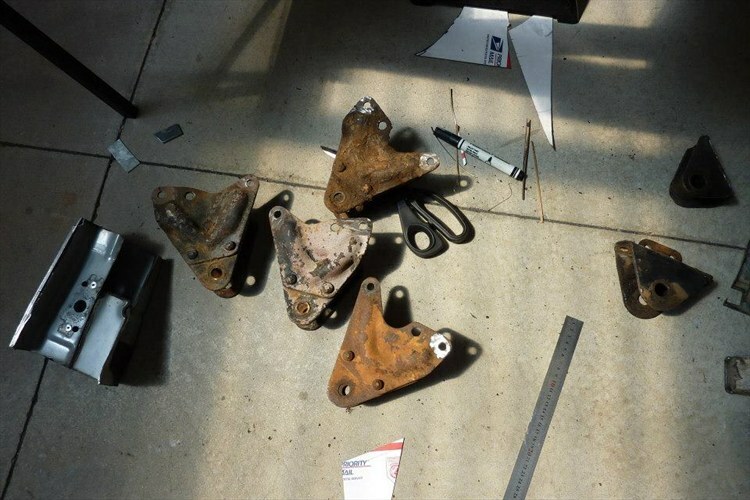 So pulled out some of the original Willys suspension mounts to see if they could be utilised. 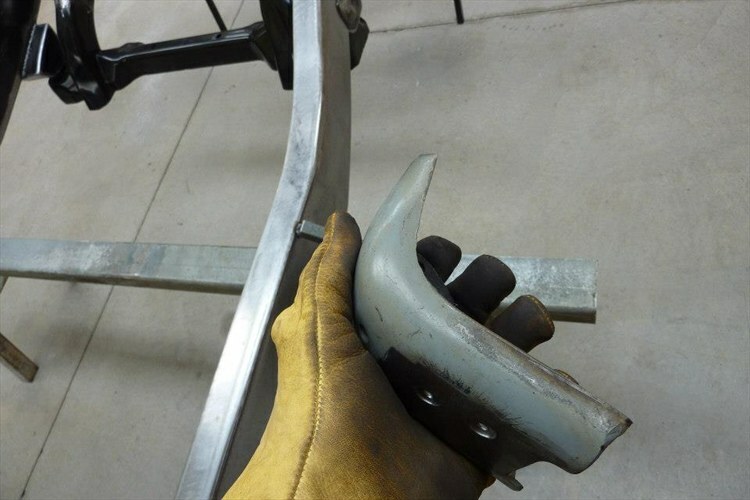 Choose the original leaf spring mounts that were on this part of the frame originally and cut them to length after removing the original rivets that held them together. Thought this suited the frame better seeing this mount will be visible behind the front wheel under the guard. Then folded up some plate to follow the shape of the mounts so they could extend from outside the frame, to the inside and over the cradle mounts. Got one done and now making the second one the same. Folds match the mount well enough considering just done in a vice with a hammer. Here you can see the mount come out over the cradle. 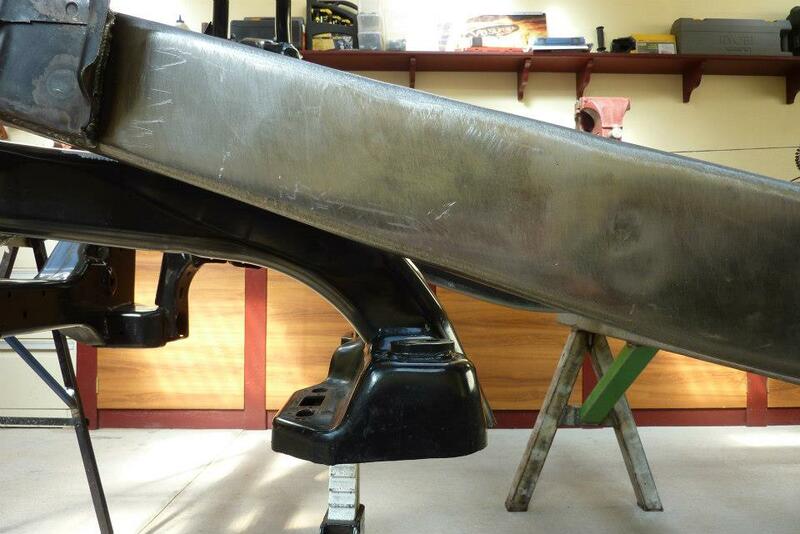 Part of the donor mount sits inside it to check its position before being welded in later. This makes it mount in exactly the same way as in the donor. 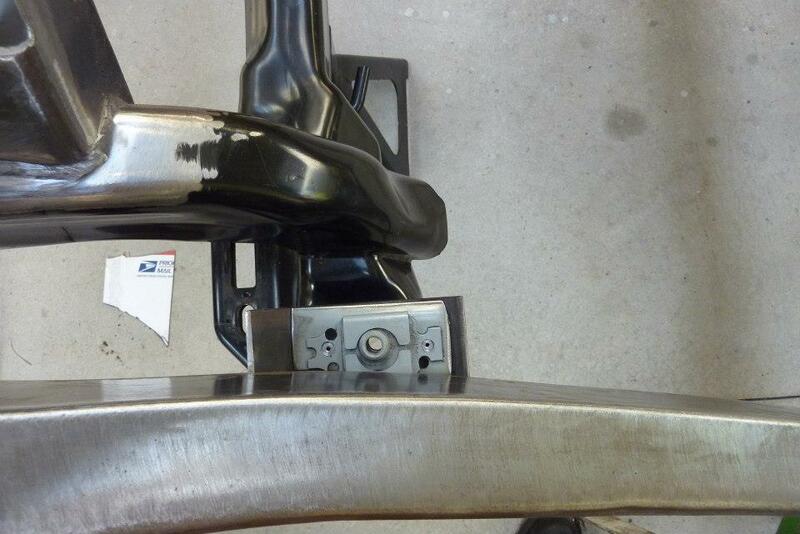 Blasted the old leaf spring mount with garnet inside and out before welding some of it together. Not sure if I will add the original rivet heads into the old holes or not. Might make the contrast of old and new a bit much. Last edited by Gojeep; 08-01-2017 at 03:14 AM. Ha ha, I have a bit of OCD so try to keep thing neat and tidy! All the left over parts etc for later in the build, are in another garage and shed that I built just for it all! That way I can make the most of the space I have as only live on a tiny block of land that is 485 sq. 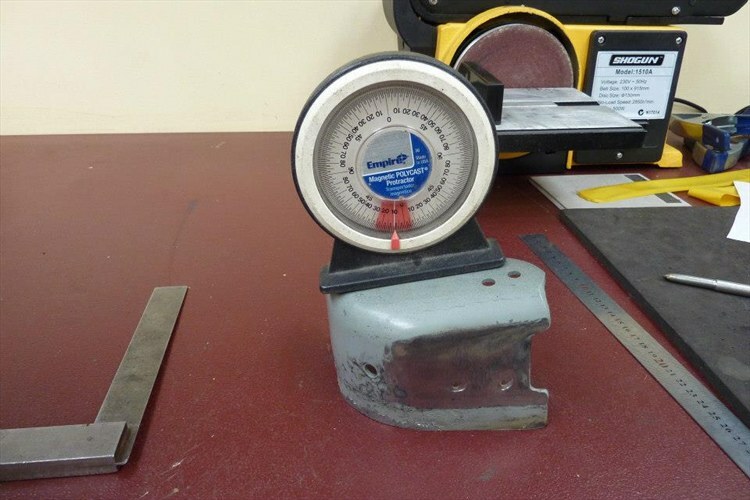 meters or 5220 sq. feet. 2 bedroom old house I think is less than my shed space. Have no backyard as taken over by workshop which is on the fence line on two sides there and attached to the house on 2 sides too. Less time then needed to mow and weed and more time in the workshop. Last edited by Gojeep; 10-10-2014 at 07:25 PM. That is some really good work you're doing. I recall reading about your cherokee a few years back. I had a 47 CJ2 Jeep and a truck like this one so I am following with interest. "So to level it I used a technique used often in bridge straightening. To bring it down, most of the heat needs to end up at the bottom so it shrinks more once cooled. So you start at the top of the triangle and weave your torch slowly to the wider part as shown." In the late 1950s I took a materials course at the University of Washington, taught by a Professor Holt. His father had actually invented the process you described, and Holt and his father had done some testing and experimenting to determine the optimum heating patterns and techniques for plate, I-beams, Tubes etc. In the early 1950s a log jam came down river and severely damaged a highway bridge. The Holts bid on the repair, and as their bid was by far the cheapest, got the contract. After several weeks of flame bending, the bridge was repaired, but the state refused to pay the agreed price because "you didn't replace any structure, and your only cost was a few tanks of oxygen and acetylene." I don't recall the outcome of the lawsuit. In about 1959 a fire damaged a large airplane hangar at McChord AFB near Tacoma. The inspectors said it was not repairable, tear it down. Professor Holt inspected the structure and made a bid to repair it -this time with an iron-clad contract. For several weeks he spent his weekends climbing around in the roof structure, making those little wiggly lines with his chalk, and then his welder would spend the week straightening the beams. Numerous technical papers have been written over the years regarding heat straightening of beams and in ship building, but all of these papers are dated long after the Holts developed the process in the 1940s, and their names are mostly not mentioned. 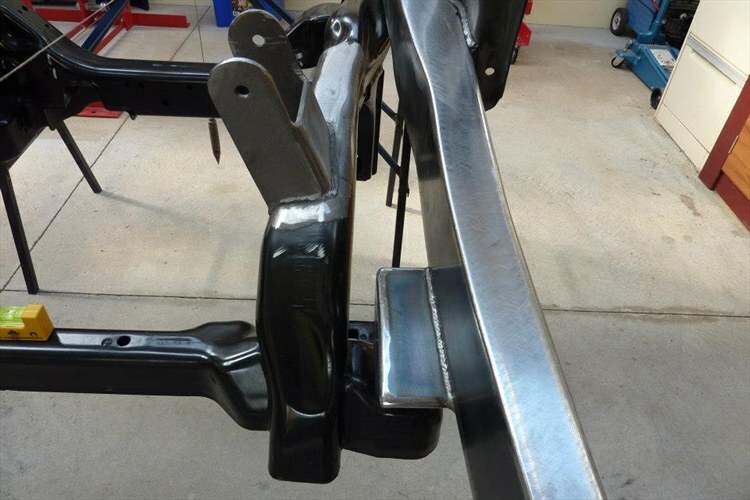 You seem to be really serious about that Jeep you are building - nice work. 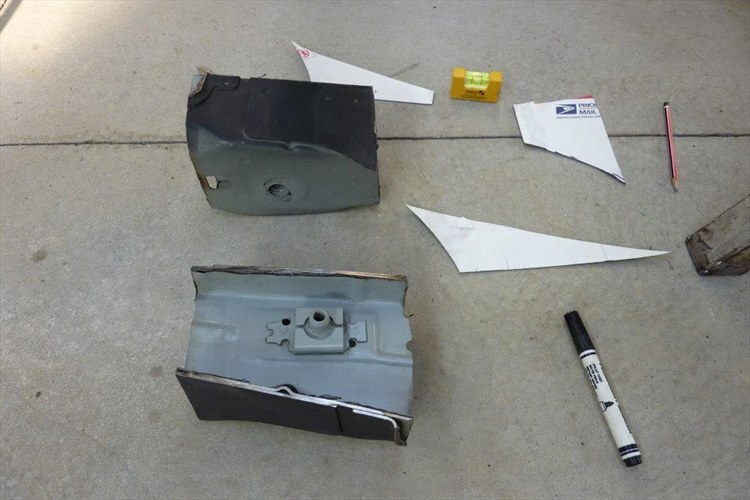 This is the pedestal that the caged nut sits on from inside the donor frame. 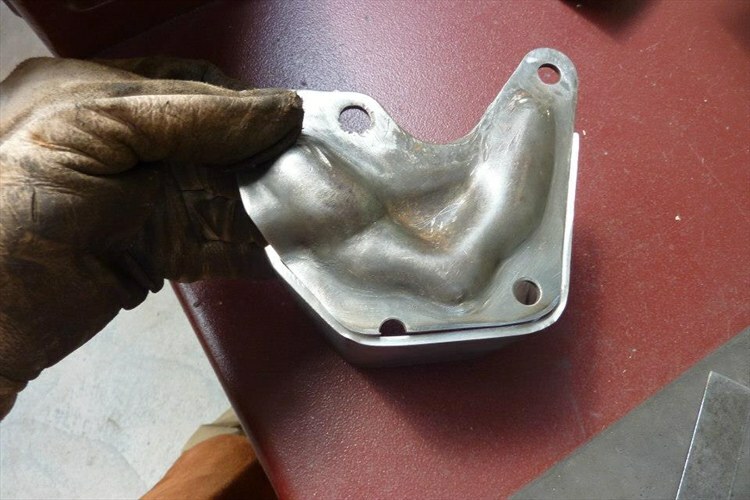 It will be welded inside the new mount so the original arrangement is used. Welded the mount into place. I also curved the top piece so it looked more factory and also gave me a bit more clearance above the caged nut so the bolt had plenty of threads showing through it. 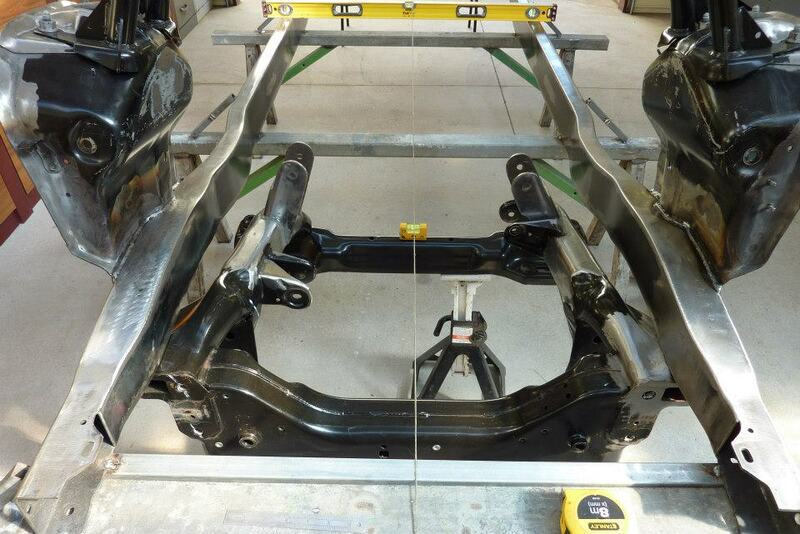 This gives you a better idea of how it is braced across the bottom of the frame rail for support. With the bracing done underneath the frame instead of up the side of it, I have left room in case I make my headers come over the mount. That completes the mounting of the cradle. Might not look like it but that now means I have the mounts for the front swaybar, steering rack, front differential, engine mounts, upper and lower wishbones and the upper and lower coil/strut mounts finished. Time to move onto the rear. Last edited by Gojeep; 08-01-2017 at 03:17 AM. A big piece from the donor going in now. One Chrysler rear axle with a 8.3" ring gear, electronic limited slip diff with a 3.73:1 ratio. 12.6" discs with ABS. Centred the axle under the coil mounts by placing a level vertically each side of the axle housing and measuring back to the centre of the coil hat. Can only do this if you were careful with the placement of those in the first place of coarse. 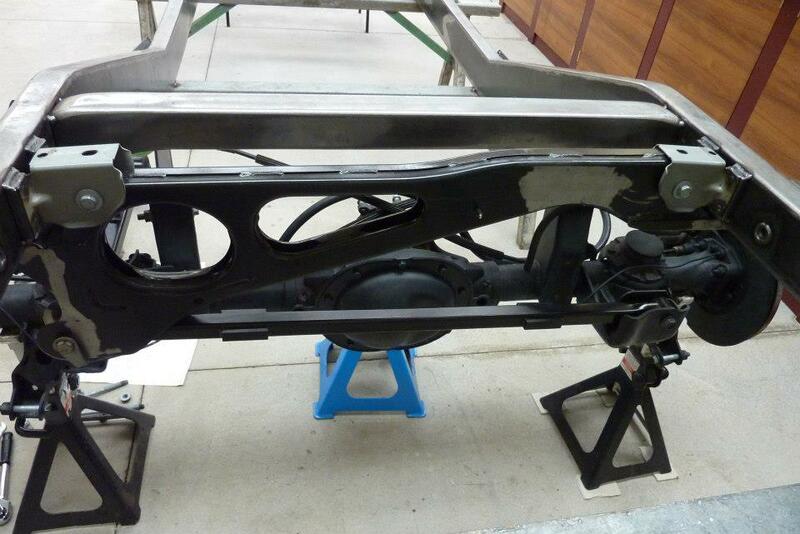 The panhard rod bolted right in and placed the axle within a millimetre of dead centre, which surprised me actually. My XJ Jeep was about 10 mm out while still stock from new. 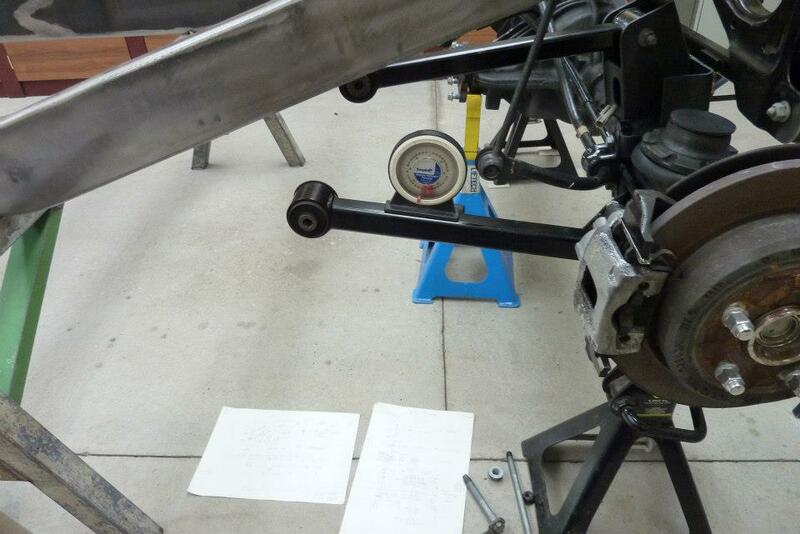 Now for the lower control arm mounts. After carefully removing the stock one a while ago, was not able to use it. This frame starts kicking up much earlier at a shallower angle than the donor, so misses by a lot. With the axle sitting at the exact height in relationship to the other suspension points already mounted to the frame, I could set the arm angles up the same as factory. This will give me the correct roll centre, anti dive etc as the Jeep engineers worked out in relation to the front end arrangement. 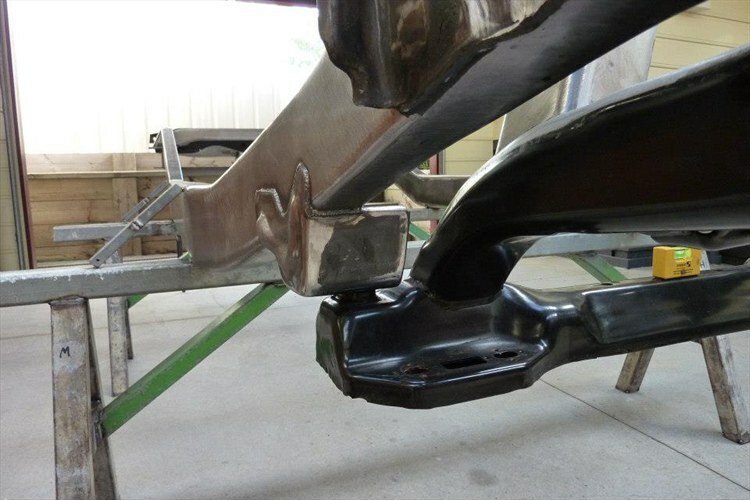 When I laid out the frame rail spacing, I also took into account that the inner frame rail would line up with the inside of the lower control arm bush. 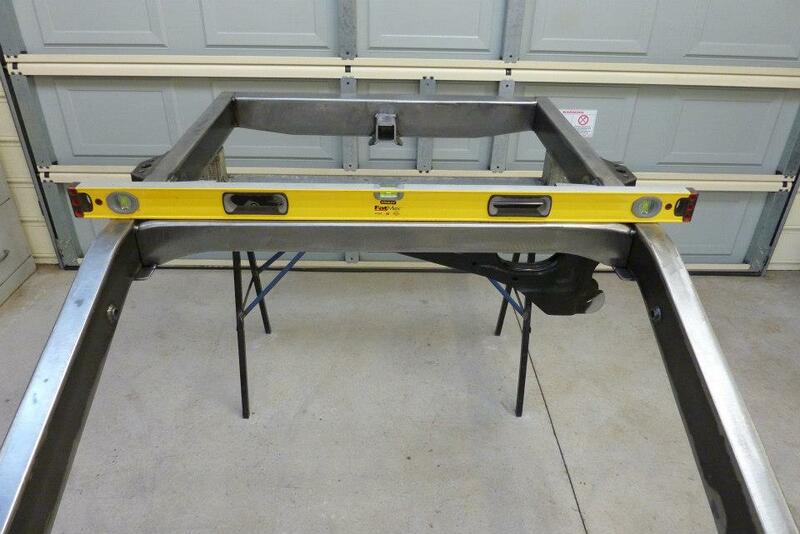 I will just have to step out the outside of the mount to line up. Just did a rough layout using taped pieces of recycled A4 paper. I left a 10mm-3/8" extra around the control arm end. 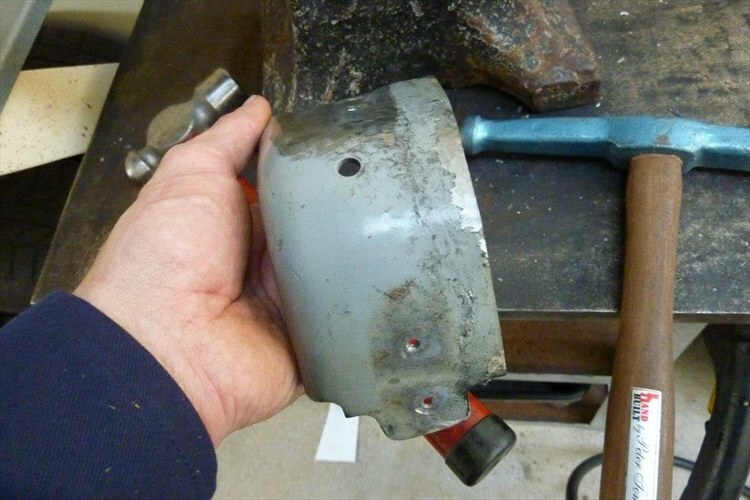 I'd rather that if it ever hits something, that the bracket takes the weight rather than the arm and bush. The outside angles of the bracket is set at 22.5*. Very common angle used in engineering and even my house roof is at this pitch. 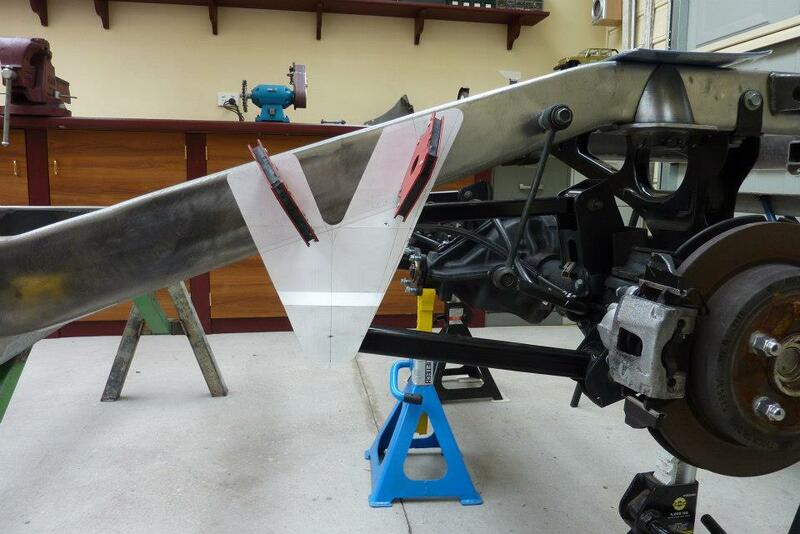 It also worked out that it would cover the upper control arm mount as well. The extra V taken out of the top is for a few reasons. 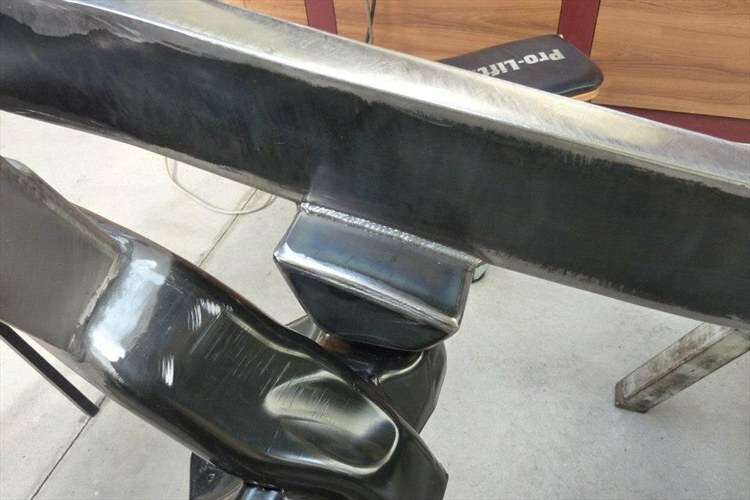 One is that it then makes the weld length on the top and bottom of the rail the same. 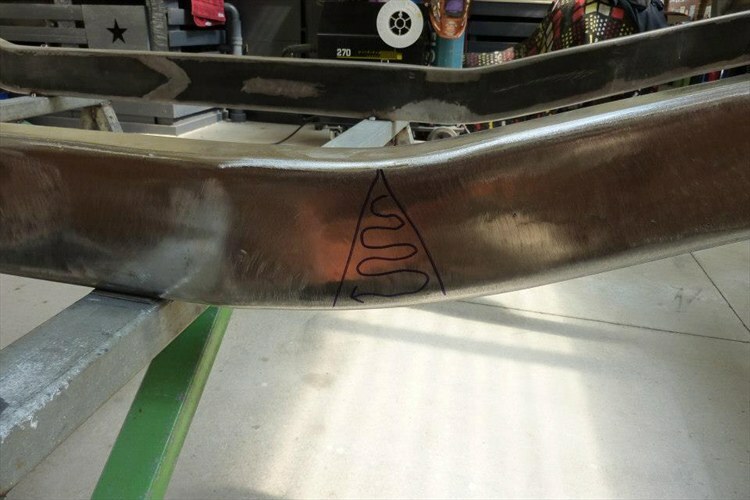 The top would have been 50% longer otherwise if fully welded and that would have caused the frame to bend upwards after welding. 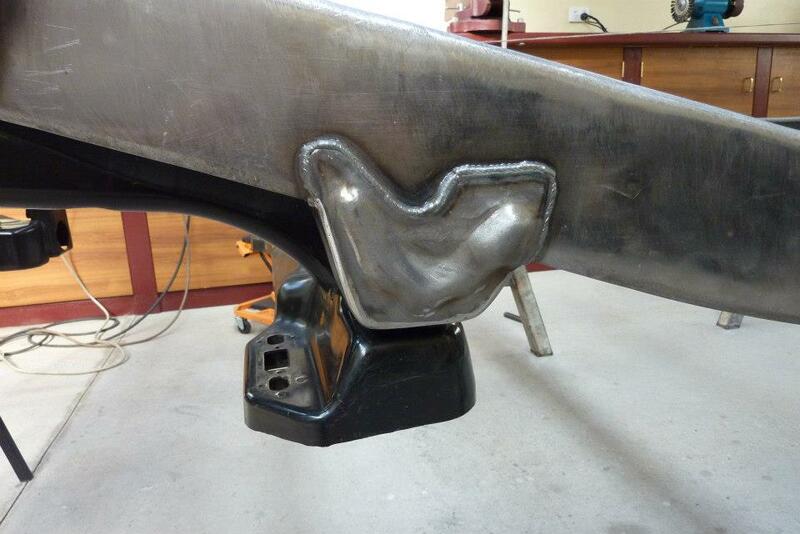 It also allows welds in the middle of the bracket increasing its strength. 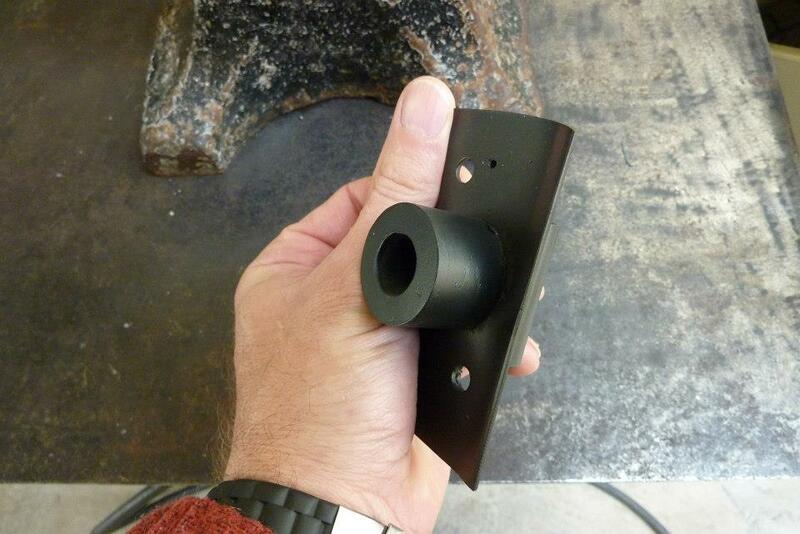 Lastly it reduces the weight of the bracket both physically and visually. Can also see the fold I will be putting in to accept the extra width the bush has over the frame width. 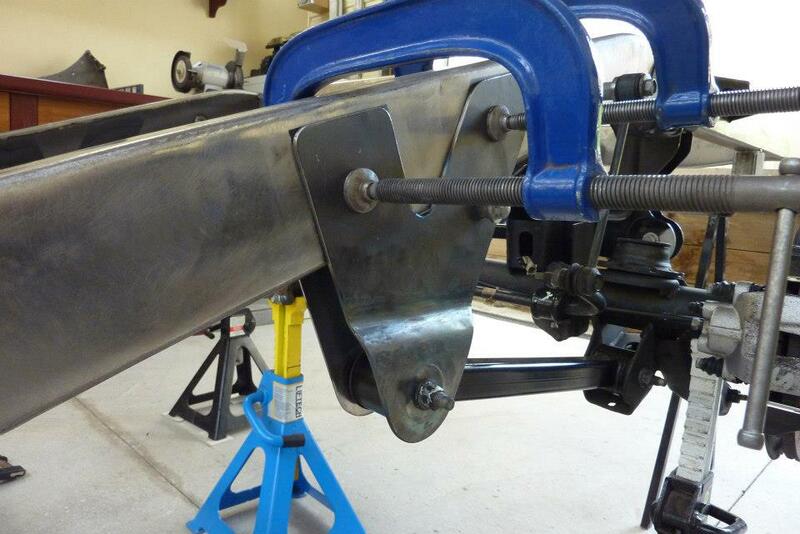 Time to start cutting out the new brackets from some of the left over 4mm plate I bought for boxing the rails. 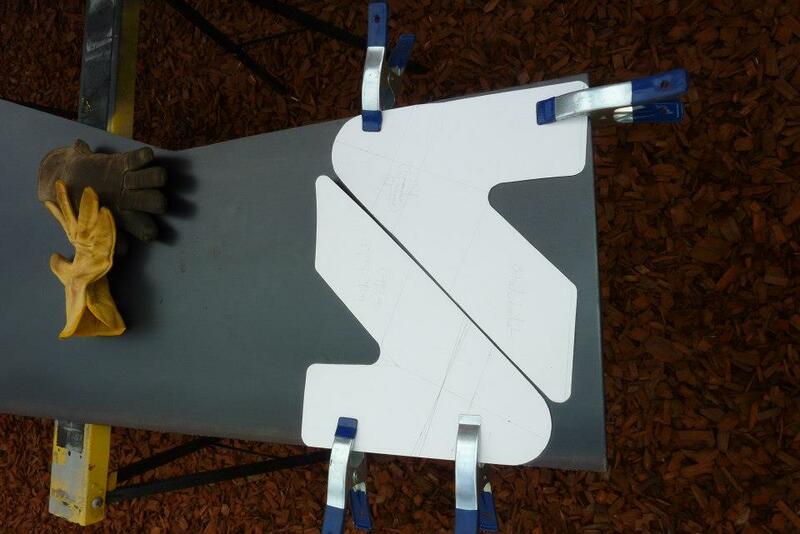 There is a inner and outer template due to needing extra length for the fold that goes into the outer one. The curved bit at the bottom of the V was first cut out using a hole saw. Then the rest just using a 9" cutoff wheel. Now the lower arms do not run exactly parallel with the frame and skew outwards by 3*. 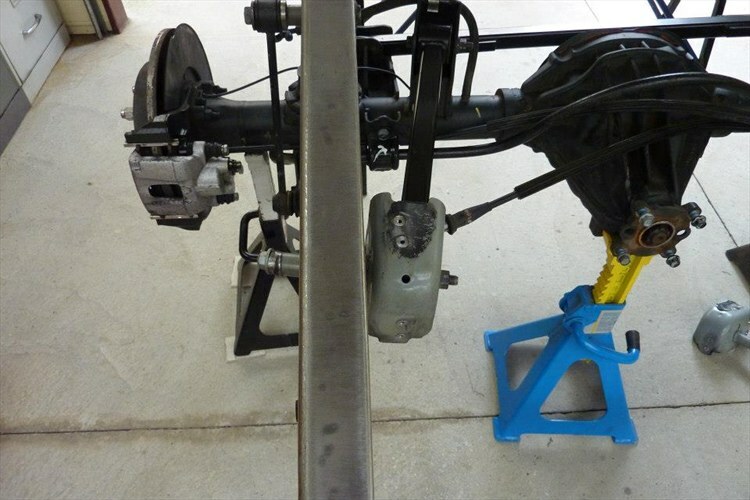 This is common and helps reduce binding during axle articulation. The way they set the original mounts up was to press the 3* around the mounting hole. I decided to do simulate the factory way by cutting out a 2" disc using a hole saw around the mounting point, tacking it in top and bottom, then tilting it to 3*. Then fully welding it back in again. It is not much of a tilt, but means the bush wont be under constant tension if it had not been done and will therefore last a lot longer. Last edited by Gojeep; 08-01-2017 at 03:22 AM. Fold has been put in the outside plate. Did the first one cold with just a hammer in the vice, but found it easier to preheat it with a propane torch to do the others. 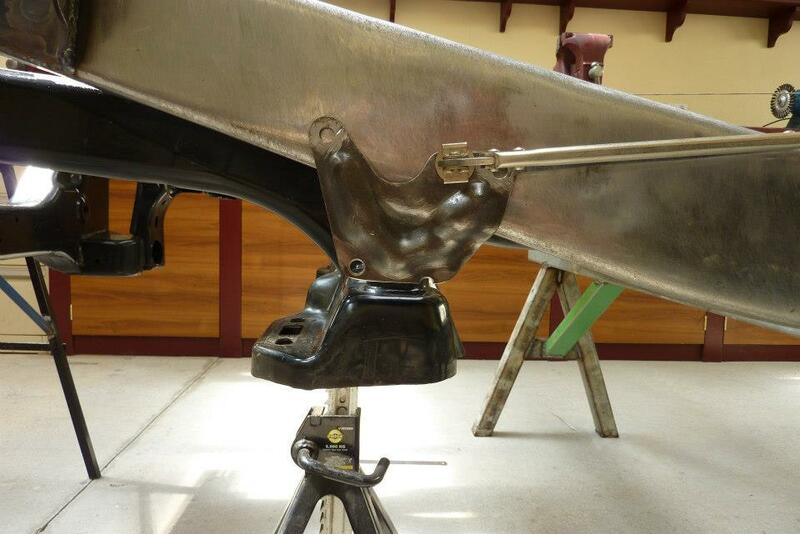 This is how the original upper control arm mounted. 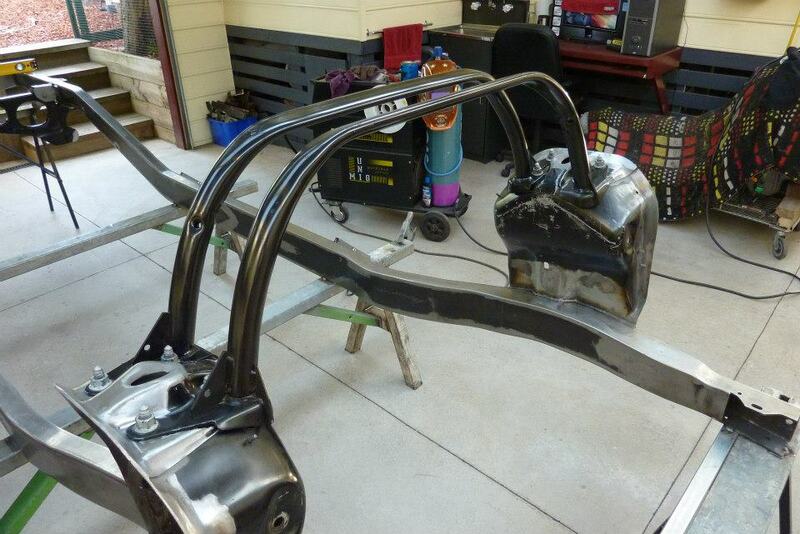 The donor frame kicked inwards a bit at this point and the sides of the frame were not vertical. That is why the gap on the inside of the bracket. 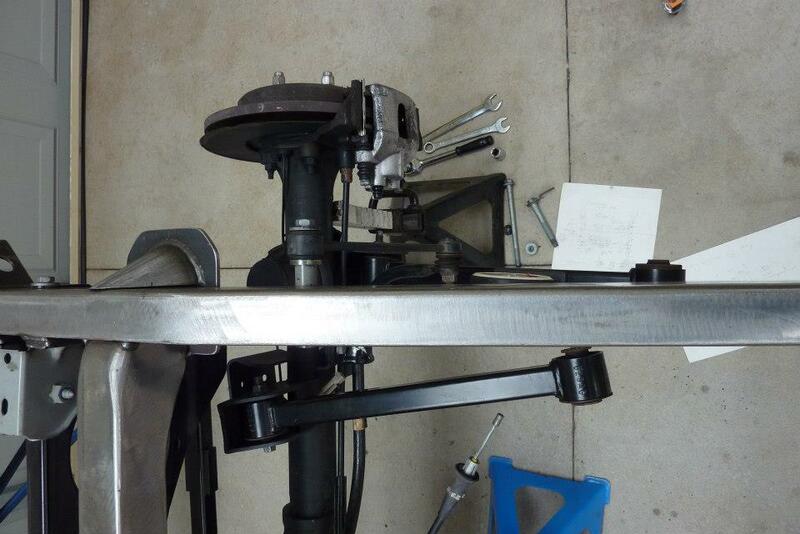 The control arm actually sits on the end of the tube that passed right through the frame to the outside. 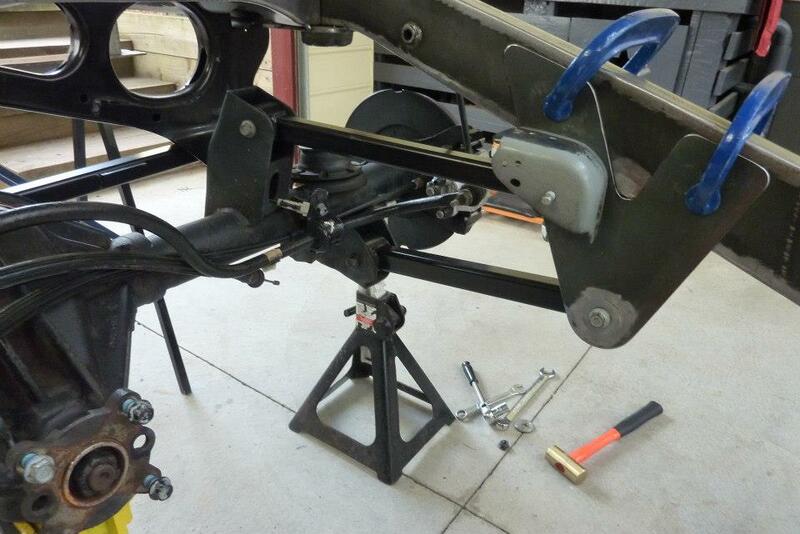 I want to do the same thing but will use the lower control arm brackets as my frame kicks up too high. 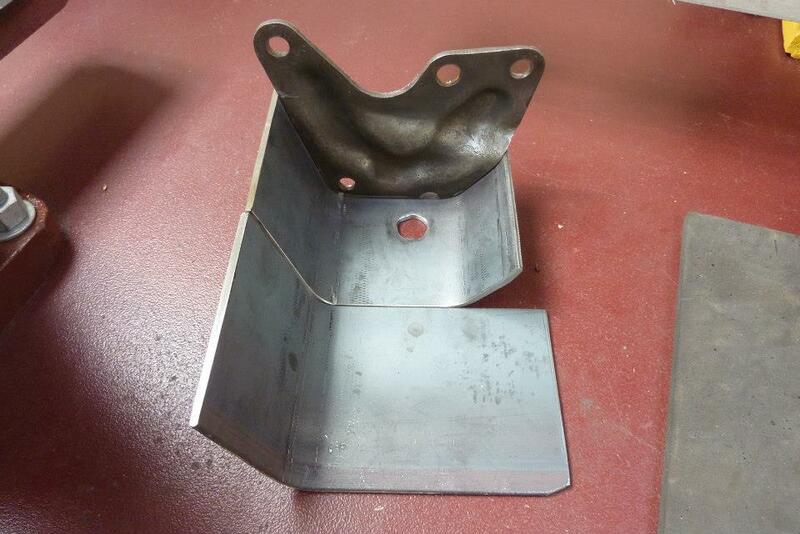 I have cut away the tubing from the bracket as don't need the piece of sheet metal it was attached too. 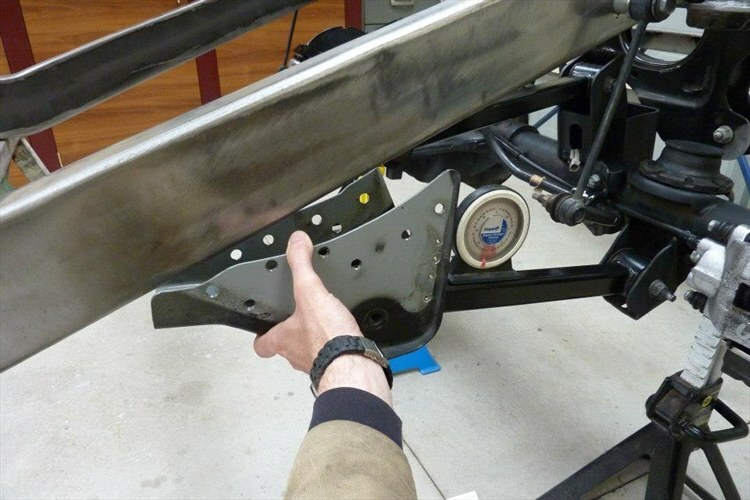 My control arm bracket is twice the thickness of the frame rail that it was originally spot welded too and will weld it directly to it. I left the extra to see if I can bend it out to fill the gap between the bracket and the frame rail. 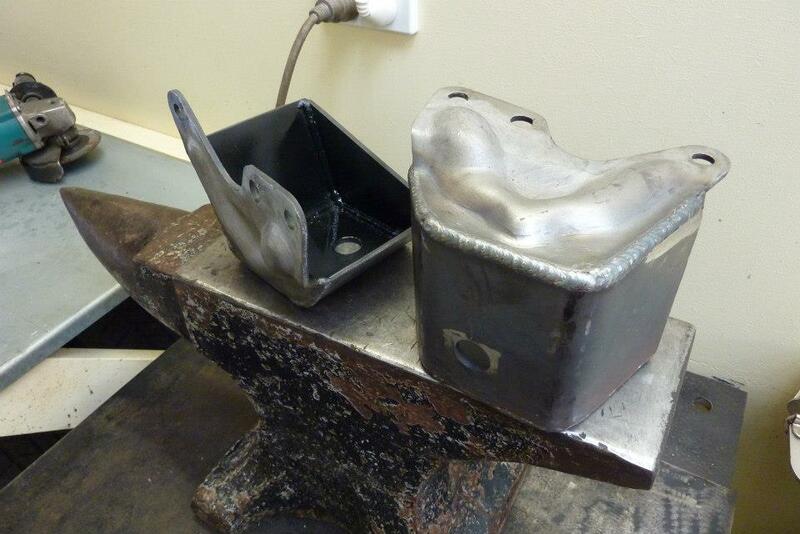 The fold now has been straightened out just using the two hammers shown and the anvil. Just requires some dressing yet. 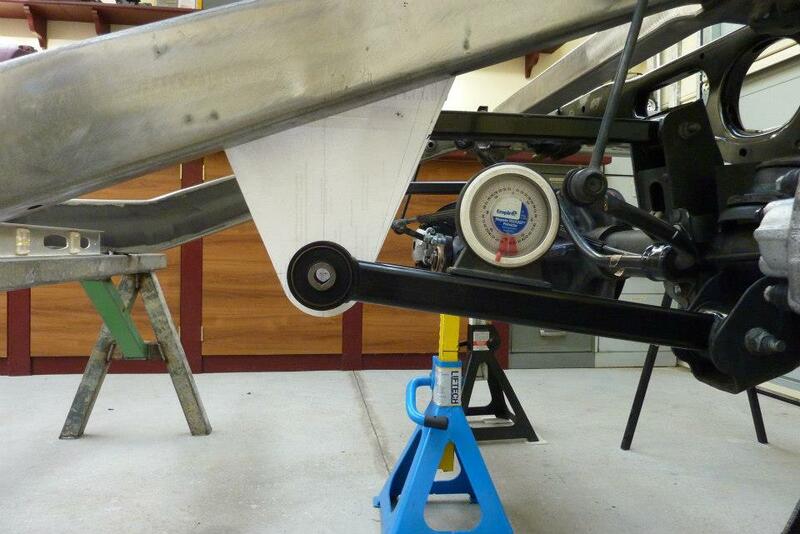 The UCA's, (Upper Control Arms) angle inwards at 10 degrees. I made sure the bracket matched the angle and was level the other way. 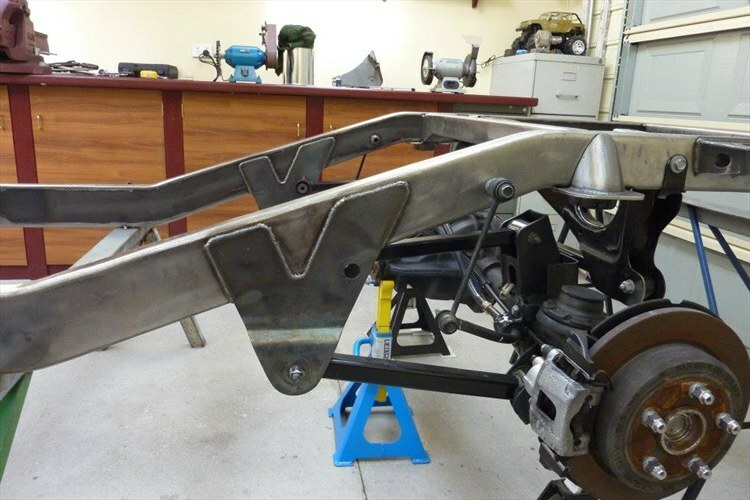 Here are the upper and lower control arm brackets mocked are into place to check that all lines up before the welding is done. It is crucial that the pinion angle is properly set also. This one is at 6* as it was from the factory and it matches exactly the output flange of the transfercase. 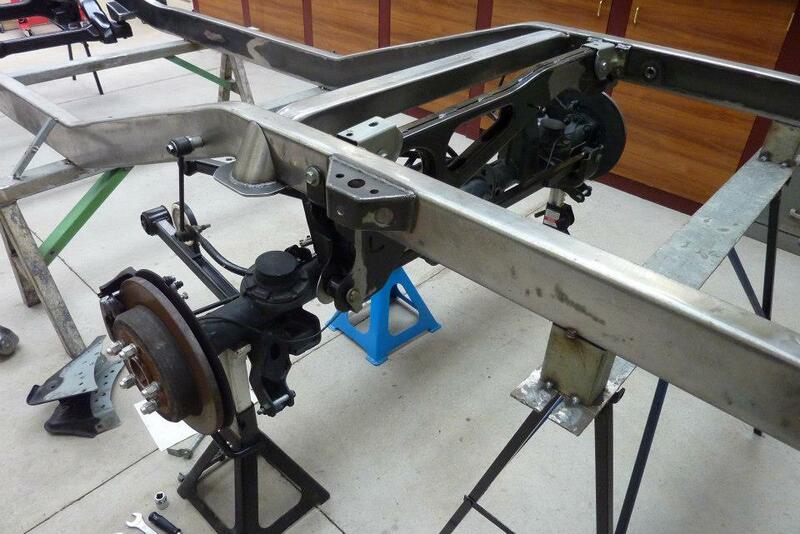 Cars are usually around 3* with their drive-line angle with there gear box and pinion angle matching to prevent vibes. Last edited by Gojeep; 08-01-2017 at 03:26 AM.